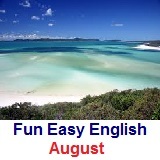 ﻿ Fun Easy English - new classroom free online classes english language lessons speaking listening writing reading introduction. A lesson for every day of the year. GOOD LUCK with your English language studies in 2019. 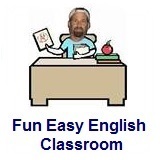 Happy New Year - Welcome to the Fun Easy English classroom. Begin with the January 1 lesson and then continue every day. 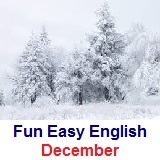 At the end of the year you will see a dramatic improvement in your English ability. Love and Relationship Month - This month in the classroom we will focus on love and relationships, along with the usual pronunciation and grammar lessons. Lots of fun lessons, surveys, and activities. 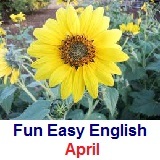 Spring Has Arrived - Grammar this month focuses on nouns and pronouns. Pronunciation lessons continue with vowels. Learn a few new reductions. Getting Warmer Now - Hey time to take your pc, iphone, tablet, or whatever, outside and enjoy the sun while studying with Fun Easy English. 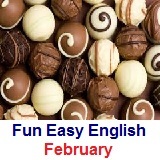 Grammar this month focuses mainly on pronouns. Pronunciation of English vowels continues. Yup more reductions. Heading Towards Summer - Temperatures continue to get warmer. 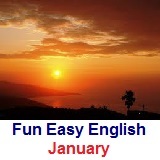 This month in the classroom grammar focuses mainly on articles and verbs. Pronunciation lessons include the last few vowels sounds. And of course you will be learning some new slang, idioms, and reductions. 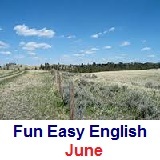 Summer Has Arrived - This month in the classroom you will begin learning English consonant pronunciation. Grammar continues with verbs and then on to adverbs. Independence Day - This month celebrate an important American holiday, Independence Day. Learn all about this holiday with fun lessons and activities. Grammar focus is on adjectives. 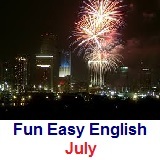 Hot Summer - Grammar in the classroom this month focuses on prepositions and conjunctions. Pronunciation of consonants continues. 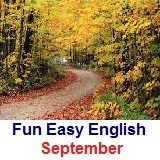 Autumn Has Arrived - This month Fun Easy English Classroom celebrates another American holiday, Labor Day. Learn all about this holiday which is the unofficial end of Summer in the United States. Grammar focus this month is on clauses and sentences. 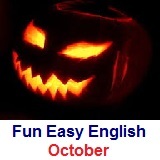 Happy Halloween - Celebrate Halloween and learn all about this holiday. Grammar focus is on punctuation. 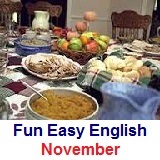 Happy Thanksgiving - This month in the classroom celebrate Thanksgiving. Learn all about this holiday. Grammar focus continues with punctuation. 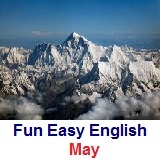 Happy Holidays - Hey congratulations for completing a full year of English lessons in the Fun Easy English classroom. 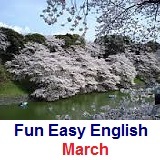 Even if your English is perfect now, come back again next year for more Fun Easy English lessons. Please ask your friends to join you. GOOD LUCK with your English language studies in 2020. 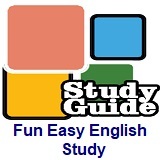 Thank you for joining the Fun Easy English Classroom.